Facing an interview is probably the scariest thing before getting hired for any job. Appearance and first impression are very powerful. When you are short-listed , it means you qualify the first round. You have the skills and certificates that they need, but when you are facing a second round which is job interview process , you need to prove yourself, your ability and your skills, to land your dream job. These are some of the most powerful tips, that help everyone, experience or freshers to win the job interview process. Your confidence can attract positive attention and open up new opportunities. 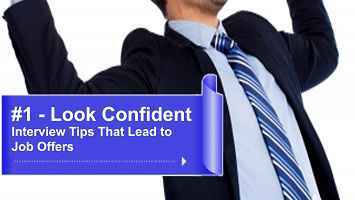 So follow these effective tips to increase your confidence level. If you can develop good posture you’ll appear approximately 100% more confident within seconds. Take a deep breath through your nose and then slowly blow it out through your mouth. Repeat these several times, you will feel your confidence level increases. Raise your hand to offer the handshake as you approach someone, but shake the other person's hand firmly. Standing with your feet too close together can make you appear timid. A confident person literally has two feet firmly planted on the ground. Practice improving your body language, social interactions, and confident lifestyle. Try to make eye contact but remember do not stare. Do not linger your eyes, looking down, looking away, and not looking at the interviewer directly in the eyes, here and there. if you manage to Pick your chin up and look straight ahead, you probably look more confident. Try to keep your legs balanced even when you're sitting. You will look anxious if your legs are twisted around or tapping. Steeple your fingers together and rest your elbows on a table. When sitting down, lean back in your chair. Use the armrests if they're available. Do not speak fast or volume up your voice, because When you get nervous, your voice tends to go up a few notes and you’ll talk faster than you realize. Gesturing with your palms up gives the illusion of honesty, and this will make you appear more confident. Cut out words such as 'um' and 'like,' and practice being more articulate. if you don’t smell like cheese, you look more nervous than you are. You need to develop, not a fake smile, not a creepy smile, but a genuine smile. If you have trouble keeping a natural smile, just flash a brief smile and return to a more neutral expression. Once you are done with your interview preparation, don’t give yourself hours to get nervous, in fact concentrate on something else to occupy your mind until it’s time to present. Try talking with more strangers, so that you will gain your confidence level. Try to stop or pause 2 seconds after each line, while answering questions.Keep a chamomile tea bag in your wallet. It makes you calm down in any situation that makes you nervous. So it’s a great “secret weapon” to have in your pocket.Another tip is, simply ask a question and then listen to the response.